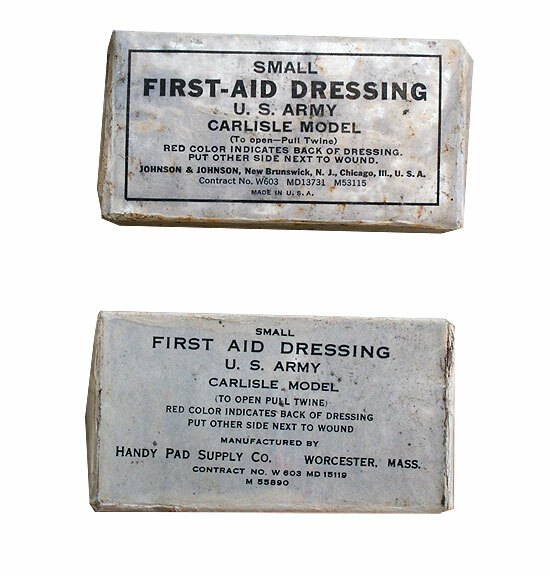 The Carlisle Model First-Aid Packet was originally designed at, and took its name from the Carlisle Barracks Military Reservation, Pennsylvania in the early 1920s, the same place where the “Medical Department Equipment Laboratory” was first established on October 1, 1920. 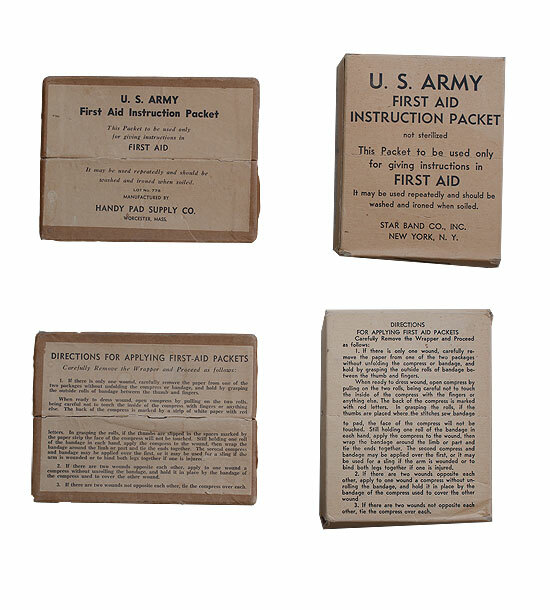 First Aid Packets had been in use with the US Military since before the coming of the Great War in the form of the FIRST AID PACKET – U.S. ARMY (shown below). Obverse & reverse of the FIRST AID PACKET – U.S. ARMY manufactured by Bauer & Black, Chicago, Illinois, U.S.A. (contract August 1918). This dressing, already developed in 1904, and subsequently introduced in 1906, was supplied to the troops in a sealed brass casing, to protect the bandage inside against gas attacks, and to also ensure that it remained sterile. 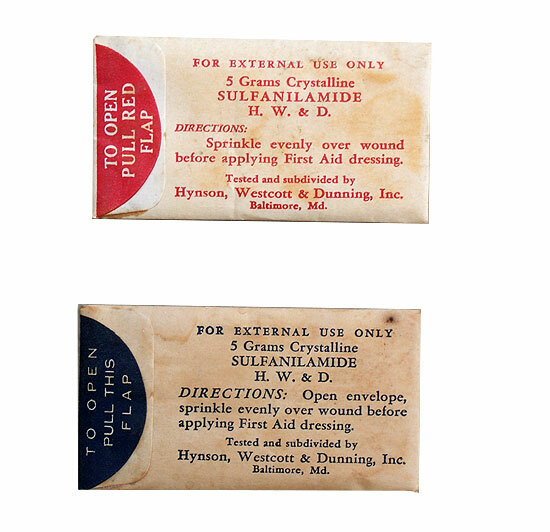 Early examples of these First Aid packets were opened by pulling a metal D-ring, which separated the two halves of the packaging, revealing the paper-sealed bandage within (contents consisted of 3 separate items: one sterile bandage, another sterile bandage, and two large safety pins). As medical advances and discoveries were made, it was found that the First Aid Packet was inadequate for dealing with front line casualties and wounds (nevertheless, millions were produced during World War 1). 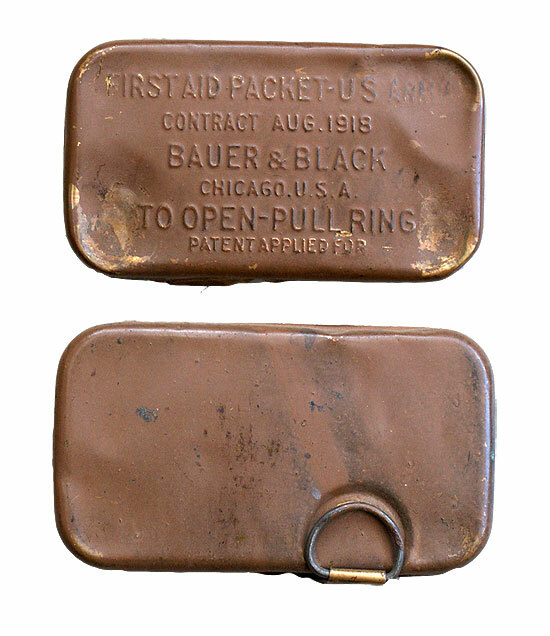 Following the Great War, millions of First-Aid Packet – U.S. Army (manufactured by Bauer & Black, Chicago, U.S.A.) containing small sterile dressings and carried by each soldier in a pouch attached to his pistol or cartridge belt, were still available packed and sealed in their little brass Olive-Drab container. Notwithstanding the general policy to utilize existing stocks first, the Medical Equipment Laboratory (part of the Medical Field Service School, Carlisle Barracks, Pennsylvania) started investigating methods to improve existing medical equipment and explore the possibility of introducing new products. 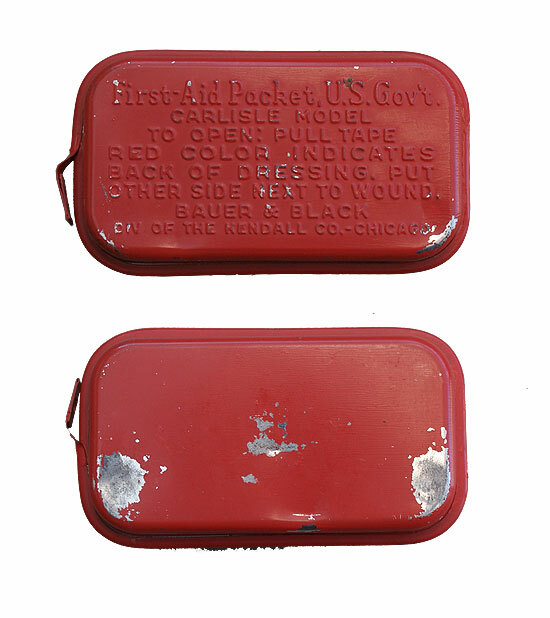 Studies were started in 1922 which would ultimately lead to a new First-Aid Packet, U.S. Government, Carlisle Model (new metal container with improved contents). 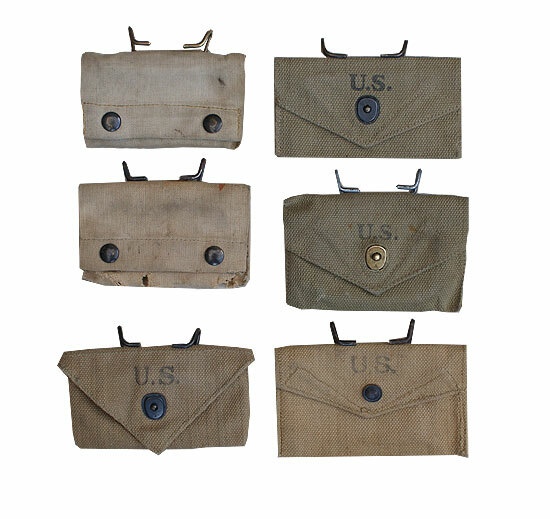 The 1927 Depression and budget restrictions would however hold up manufacture, although its characteristics were widely known to the US Army authorities, with the ‘new’ item being designated First-Aid Packet, New Style. The Carlisle Bandage however underwent a number of changes in its development during WW2. This article will examine and outline these various modifications. 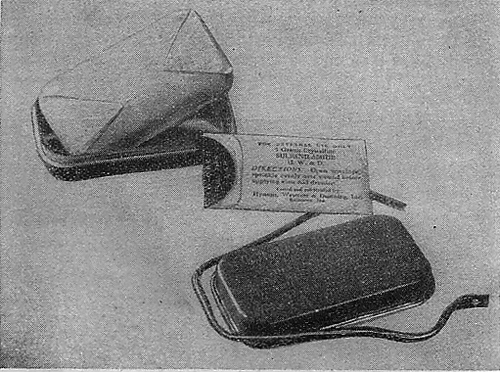 An illustration taken from FM 21-11 – First Aid for Soldiers, April 7, 1943 showing the contents of the Carlisle Model First-Aid Packet container. Illustration showing two examples of the Packet, First-Aid, for Instruction, 2 (Item # 2031000), which was used as a training aid for applying First Aid Packets to a wound. The version at left is made by the Handy Pad Supply Company (Worcester, Mass.) and the variant shown on the right by Star Band Co. Inc. (New York, N. Y.). 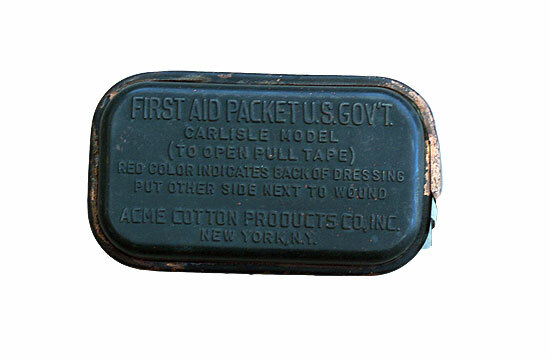 Very early examples of the Carlisle Bandage tin were issued in sealed, pressed brass, rectangular containers (cover, box, and seal), once again designed to ensure the sterility of the bandage contained within. These early examples of the First-Aid Packets did not yet contain a Sulfanilamide Shaker Envelope (only introduced by end of 1941), and were painted using an Olive Drab #7 color shade. Containers manufactured by the Medical Department workshops did not bear the Department’s markings, while those supplied by Bauer & Black of Chicago, displayed the manufacturer’s name. More manufacturers would receive Government contracts. Initial numbers of the new container were produced by the Medical Equipment Laboratory (without any indication of the supplier’ name). Later, a contract was signed with two suppliers (Bauer & Black, Division of the Kendall Co., Chicago, Illinois + Handy Pad Supply Co., Worcester, Massachusetts, but the contractor was Conray Products Co., New York, N.Y.) in 1940 calling for the production of 2 million First-Aid Packets, but it was estimated that delivery would not be completed until March 1942. Brass sheeting, needed to manufacture the metal case which enclosed the dressing, could not be obtained in sufficient quantities. To solve this material shortage, copper was substituted for brass in contracts negotiated after March 1941, but, by the end of the year, copper was no more available than brass. Steel was then substituted and two additional suppliers were obtained who were prevailed upon to provide themselves with dies. Shortly after contracts had been made with these two companies, the War Production Board (WPB) refused to allocate any more steel for the First-Aid Packet container! Consequently, the Medical Department had to look for other solutions. In view of the above shortages and restrictions, an alternative form of cheaper packing was considered for the First-Aid Packet and in summer of 1940, the First-Aid Dressing made its appearance. 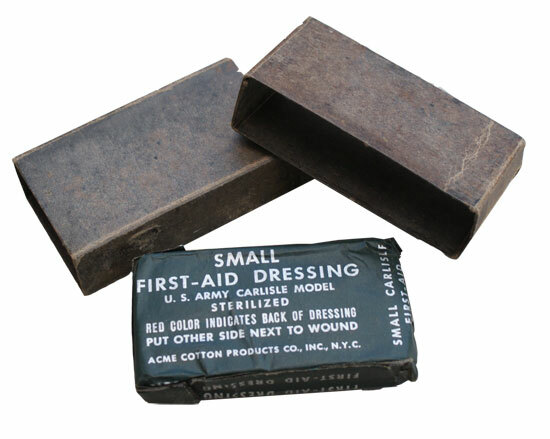 The Small, First-Aid Dressing, U.S. Army, Carlisle Model was contained in a rectangular tuck-end carton, printed with the required markings, and dipped in wax (water-repellent treatment). Two examples of the second variation, waxed cardboard model. The top piece has been made by Johnson & Johnson (New Brunswick, N. J. + Chicago Ill.) and the bottom example by the Handy Pad Supply Company (Worcester, Mass.). As the war raged on, the supply of strategic materials, such as steel, iron, copper and brass became more limited, and so the Government pressed for a number of studies to develop alternate solutions. One of the first alternative results was a simple, white, waxed tuck-end carton, containing a bandage, designated Small First-Aid Dressing. It was already introduced in the summer of 1940. Please see above illustration. Front view of the “Tenite” variant manufactured by Acme Cotton Products Co., Inc., New York, N.Y. In the middle of 1941, the Medical Department decided to amend their specifications, and placed purchase orders for containers made out of tin (instead of brass). The new version was introduced by fall of 1941, together with the very first Sulfanilamide Shaker Envelopes. When additional restrictions for raw materials became mandatory, the Medical Department once more had to be inventive, and now looked toward the expanding ‘plastics’ industry . The Tennessee Eastman Corporation produced a moulded plastic (called Tenite) container for the bandage, which once again was sealed to ensure the contents remained sterile. These slightly different variations were constructed of Olive Drab #7 plastic and manufactured by Acme Cotton Products Co., Inc. During the early part of 1943, with production steadily falling behind Medical Department requirements, the plastic container entered production. Field tests of this Packet however soon proved it to be insufficient, the nature of the material meant that the item was susceptible to warping and breakage. The obverse of this model is shown above. 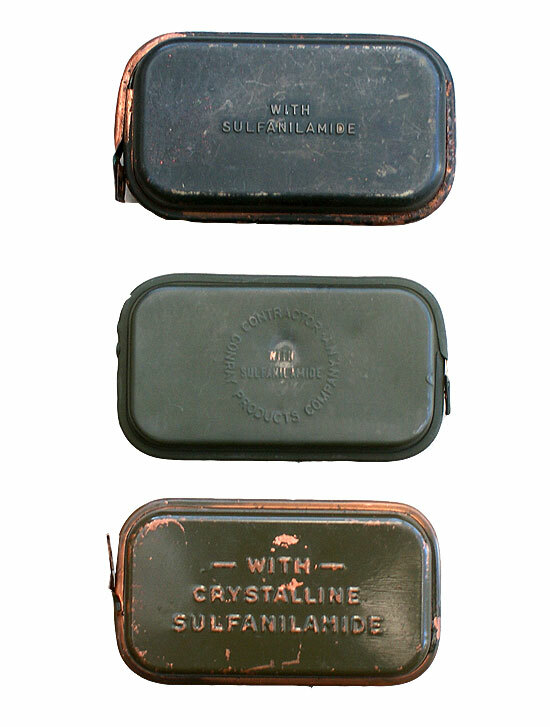 In order to identify those packets which now contained sulfanilamide, the U.S. Government began to imprint many of the First-Aid Packet tins on the reverse with the caption “With Sulfanilamide“. Various styles of this imprinting can be found, and a select few are shown below. Reverse markings of three examples of Carlisle bandage clearly showing variations of the “With Crystalline Sulfanilamide” markings. A further effort was made by the U.S. Government in 1942 to easily identify Packets which contained Sulfanilamide (but without indication of same). Existing Packets (previous production runs) were therefore recalled, the Sulfanilamide Shaker Envelope added and the Packet refinished in a red-orange colored paint to identify the Packet as containing Sulfa. See illustration below. Obverse & reverse of the later war variant, finished in red-orange color to identify that the packet contains Sulfanilamide. Notice how the color is missing from the bottom corners of the reverse side; this is likely due to the fact that the Packet has been stored in an M-1910 First Aid Packet Pouch. This Packet has been produced by Bauer & Black (Chicago, Ill.). An illustration showing the laminated paper and foil wrapping version, with the waxed cardboard container to protect the First-Aid Dressing. It is important to note that the very first version of Sulfa drugs, made available in 1941, did contain 12 Sulfanilamide Tablets. They were subsequently replaced by the single Shaker Envelopes containing Crystalline Powder, and later (in 1942) by small containers numbering 8 Sulfadiazine Tablets. As stated above, the latter did not fit into the container, and were consequently carried inside the web pouch, or Pouch, First Aid Packet, Stock No. 74-P-260. Bauer & Black Div. of The Kendall Co.
Acme Cotton Products Co. Inc.
Hynson, Westcott & Dunning Inc. The Bay Division Parke, Davis & Co. The American White Cross Laboratories Inc. 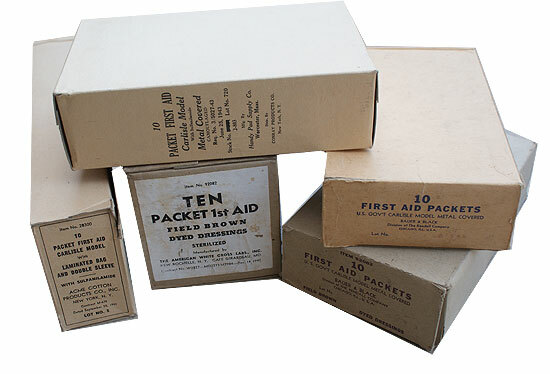 Photograph showing a variety of the outer cartons in which the numerous patterns of First Aid Packet were issued. All cartons contain 10 Packets.